It was my pleasure to be a guest on Ghost Chronicles the Next Generation and I would like to thank Ron Kolek and Anne Kerrigan for having me. If you missed it and would like to hear the interview, click here http://toginet.com/shows/ghostchronicles, recorded on 1-19-2011. To download the episode, please click here http://toginet.com/podcasts/ghostchronicles/NewEnglandGhostProjectLIVE_2011-01-19-18-56.mp3?type=showpage. 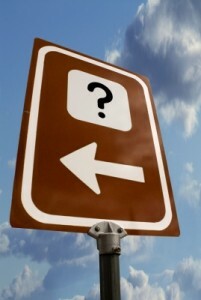 Lately, I have found that more and more people are asking me about signs from beyond. As you all know, I am a firm believer in signs. They can show up anywhere, literally, but it is up to you to notice and recognize their meaning. They may show up in the form of a song on the muzak at the mall that you directly connect to a person who has passed. Maybe you are routinely plodding through your day and you have an out of the ordinary object placed in your path, or you see a random cloud formation that is only there for moments. It could possibly be in the form of a feeling of comfort that comes over you when you are upset. Seeing a certain image or piece of art may spark a memory of a certain person who has passed and may be a sign. Perhaps, as in this instance, you may read something randomly. One day as I was driving on the highway, I was thinking about a former colleague of mine. I had worked with this person and had long, long talks with him. He and I had both been hurt by people who were trying to make a quick buck through deception. We both commiserated about how they lied about credentials and boasted untruthfully about things they had done and the people they had(n’t) worked with. False claims were even made about genealogy. We were both used and conned, as were many of our friends and aquaintances. We spoke about how truth is so important, especially in the paranormal field, where the truth and your credibility go hand in hand. It is all you have. After having these therapeutic talks with my former colleague, I was shocked when he started down the exact same path of deceit. This caused me great distress, that I had been deceived, yet again. I was having a hard time wrapping my mind around how passionately he spoke about being truthful, yet he was making claims that are completely false. Just then, a car passed me on the right hand side at a high rate of speed which grabbed my attention. The license plate on the car read PSALM 37. Really? PSALM 37? When I reached my destination I looked it up using the King James version of the Bible. Psalm 37 addresses the question of why the wicked prosper while the people who try to do the right thing suffer. It also says that the wicked’s prosperity will only be temporary because God will reverse things by punishing the wicked and rewarding the good. WOW! This message was the solution to my struggle. I was thinking about this problem that was troubling me, and the answer appeared. It was right there for me to notice on the bumper of a speeding car. That, my friends, was a neon sign. I noticed it, I accepted it and I am thankful for it. Because of this sign I am at peace with what my former colleague is doing, because I know that he will not prosper by telling lies or half-truths. It is on him. His own actions will cause his downfall. I choose to stay on the righteous path of truth. Signs can also tell of future events, things to watch out for or be prepared for. I sometimes see images or faces embedded in photographs or in random patterns of ceiling tiles, wallpaper, woodgrain or floor tiles. Sometimes I recognize that they look like things or people I know. Some would put that phenomenon down to Matrixing, where your brain automatically wants to make faces and images out of randomness. Sometimes, maybe it is, but I take note and keep that thing or person in mind and focus on them while I meditate. A friend recently sent me a picture of a lit Christmas tree. On the wall, in the pattern of the reflection of the lights, stands a little boy and behind him stands an angel. It is from 2 years ago. I believe with all that I am that this was a sign to pay attention to this boy before he started down a dangerous path. Unfortunately, hindsight is 20/20. Pay attention and listen to you heart. Be aware that there are signs all around you from loved ones who have passed and from the Angelic Realm. Slow down, take time to notice what you might have just passed by without a second thought. Look for the signs and be receptive of their meanings. Someone may be trying to tell you something! 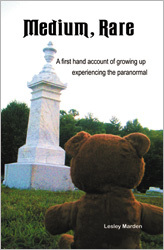 My book Medium, Rare; A first hand account of growing up experiencing the paranormal is the story of me growing up with a heightened awareness of spirit activity. When I sat down to write about the things that happened to me along my life’s journey, I thought to myself how it might help someone out there who is experiencing, or had experienced the same types of things I have and may be afraid to tell anyone. After it was finished I wondered if I should put it out there into the world. I had held on to these encounters so tightly for so long. I wasn’t sure if I was doing the right thing by loosening my grasp and throwing my experiences carelessly in to the air like a bride throwing a bouquet. After making that colossal toss and holding my breath for what seemed like an eternity, I started to get some feedback on what I had written. Almost every response I receive includes a personal encounter that the reader has experienced. People that I have grown up with who have read the book have told of creepy happenings as well as total strangers. Scientists claim that there is no proof of such things, therefore they can not be true. Because there is no science to support an encounter with a spirit doesn’t make it untrue. The truth is in your experience. Not everything can be recreated in a lab. Can you recreate the feeling of heartbreak and measure the extreme depth of feelings on a monitor? Can you recreate the moon? The moon is real, I can see it. When these scientists go to Heaven, are they going to look God in the face and tell him, I couldn’t recreate a spirit in my lab, therefore you are a figment of my imagination? I have been on investigations where more than one person has the same experience as it unfolds before them. I have seen and heard evidence from investigations that has been dismissed by nay sayers that clearly shows the faces of people, spirit activity or the sounds of human interaction. As it turns out, a lot of honest, intelligent, sane people have shared with me that they have had some sort of paranormal experience within their lifetime. I have very much enjoyed reading what those of you have shared with me. Thank you for taking the time to write a response to my book. I honor that what you experienced is true. We learn from our experiences, our experiences are our truth. It is true! I have written a book! To most of my friends, the contents of this book may be a bit shocking. I have always kept my paranormal experiences very private. Even my aquaintences in the paranormal field have never heard me tell of the happenings in this book. I decided that if one is to truly accept who they are, then they have nothing to hide. So here I go, placing my trust in the Universe. This is my way of living by example. I think that everyone should embrace who they really are and celebrate what they have to offer. You are the ONLY you there is. Honor that who you are and what you do makes a difference in someones life. That is my goal, to make a difference. Everyday I wake up with the intention to be a positive force in this world and I smile at everyone. It is such a small thing, but think how it can make a change in someone’s day. I love being at the grocery store or on the street and happen upon a person who looks like they aren’t having the best of days. A genuine smile and a warm greeting can potentially bring them a small piece of happiness when they thought there was none and hopefully help them to feel better. This book can also make a difference. I know that I am the only me there is, but I am sure there are thousands of other people out there who have had similar experiences and keep them to themselves for fear of being made fun of. For those people, you are not crazy. I am sitting here as living proof of that. No, really! I hope to use this website to post things that I find interesting to include some cool paranormal stuff that I stumble across, just by being me. Please check back soon, you never know what might pop up. Until then, buy my book! Author Lesley MardenPosted on November 7, 2010 November 7, 2010 Categories Observations4 Comments on Surprise! This is the official website of Lesley Marden, author of the 2010 autobiography, Medium, Rare. Her articles will arrive here, soon.